With the passing of the great Stan Lee, it only feels appropriate that the first Marvel movie to hit the theaters would feature his most iconic creation. Luckily, you know exactly how amazing this movie is going to be within the first 10 seconds. We open with Miles chillin’ in his room listening to a new bop doin’ the whole sing-every-5-words and hum the rest like you know the lyrics thing, and it’s just the most chilled out, relatable opening you could ask for. The slightest details can make or break a movie, but you can’t imagine how man Easter eggs and callbacks they scatter throughout this 2 hour Spidey fest. Off the rip, you’ll notice a completely unique and eye-popping animation style. Spider-Man: Into the SpiderVerse is literally, a comic book in movie form. It took about 5 minutes to adjust to the newness, but once I got my bearings, the colors, characters, and craziness all fit together perfectly and I was left to revel at this new world teeming with excellence and color. Miles Morales is given a proper Spider-Man origin story, while setting up the multiverse predicament the movie is based on. While they’re cookin’ up the meat and potatoes, we’re blessed with gems of brilliantly written dialogue about the socioeconomic status of the hood and how that looks and feels through the eyes of a Latinx teen. The continued rise of coffee shops in Brooklyn signal gentrification that is systemically pushing out decades-old residents at a seemingly inevitable rate. The placement of “random” students into highly selective schools show how elitism is privately transforming while hiding in plain sight. 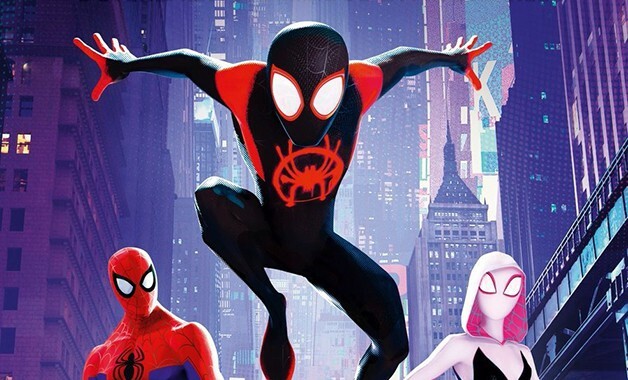 This is all to say, that this movie is much smarter than it seems, while catering to fans who want to see as much from the SpiderVerse as humanly possible. Now, onto the fun stuff. I won’t get into villainous spoilers, but just know that there are some huge villains that pull up on the young arachnid Gawd at every turn, to test Miles’ new passion for crime fighting. Luckily, our main villain’s attempt to bring their loved ones back also brings a squad of spidermen and women that help him along on his road to being ready. It takes a mean leap of faith, and Peter is obviously there to help him get his game up. Gwen Stacy pops up straight stuntin’ on both our guys, humbling them in the process. Throughout the rest of the film, 3 more members of the spider family are seamlessly worked into the plot of this wild ride, and you don’t question the authenticity one bit. Trailers and subway ads show the faces and costumes of the final 3 members of the Spidey squad, but I’ll spare you the blatant spoilers. Just know that everyone’s about to have a new fav anime girl in Peni Parker! She boasts a heart of a lion and is accompanied by that giant robot that has a very unique set of powers. We have the cartoonish version of Spider-Man, who is an absolute riot and double entendre of Easter egg deep cuts, and finally the black and white (Noir if you nasty) Spider-Man, who is a super savage from another era. He’s voiced by Nic Cage and had me in tears with his Al Capone cutthroat flow! Then we got Miles, himself. His journey to becoming Spider-Man is filled with joy, grief, anxiety and confusion, but in the end it’s all worth it. He struggles with his home life, his newfound identity and even newer powers that only he can come to grips with. He becomes a liability to the team, so when he finally masters his camouflage and this whole superhero gig, its a win for everybody. You might even find yourself standing in the theater fist pumping like Tiger in his prime, shouting all the hype bars! With any Spider-Man movie comes the need for genuine comedy and outright funny moments, and SpiderVerse has them in spades. From the New York AF moments of commuters not giving a dam about the wildest things happening in the streets, to Miles running around with one Jordan on his feet, the funny moments don’t stop. Watching a struggling hero learn how to use their powers is always a knee-slapping good time and this one is no different. But personally, what’s most impressive is the fact that audiences are trusted to enjoy mindless comedic moments as well as quality humor that requires callbacks to the beginning of the movie, references to things that happened in comics, jokes about the animated series and shots at previous live action films. You get to be a kid again while being respected to get the deep cuts. Ladies and gentlemen, its time to get your Timbs and Spidey masks ready. Order yourself a fresh pair of red and black Jordan 1s if you about that stay fly life. Break out your 2002 web shooters and come silly string strapped up! Last but not least, get yourself a reserved movie ticket ASAP because this movie is a visual masterpiece that is going to sell out quick, and I cannot wait for everyone to indulge in the spectacle of it all. Top notch voice actors like David Tyree Henry and the eccentric Shameik Moore infuse emotion into their lines and transform ordinary scenes into touching moments that’ll make some fans a bit misty-eyed. Hilarious moments will keep you excited for what comes next, and once the web-slinging fam goes full force and the action pops off, you’ll be fully entrenched in the Spiderverse. Finally given the full-length feature treatment, dropping on December 14th, we can officially say that Miles Morales is here to stay! Check out our interview with Miles’ voice actor Shameik Moore here. Also check this editorial on how NYC was the place to center Miles in this animated tale here. Can’t wait! I was worried when that second trailer came out and it was Miles light. 52 reviews on Rotten Tomatoes at 100% Fresh. Sony has already greenlit the sequel and a female Spiderverse spin-off.56 years of the Spider-Man character, this is the first time a dark-skinned person has “worn the webs”. It seems like every Spider-Man production has one scene where Spider-Man shoots web at what seems to be the sky. Like, he’ll be in an area of one-story houses with no trees and he’s pointing his arm straight up. Has anyone else noticed this?